Danum Valley offers the most authentic wildlife encounters in Borneo: it’s the best place to see truly wild orangutans and the rare Bornean pygmy elephants. There’s only one lodge inside the vast wilderness of Danum Valley Conservation Area, the luxurious Borneo Rainforest Lodge. 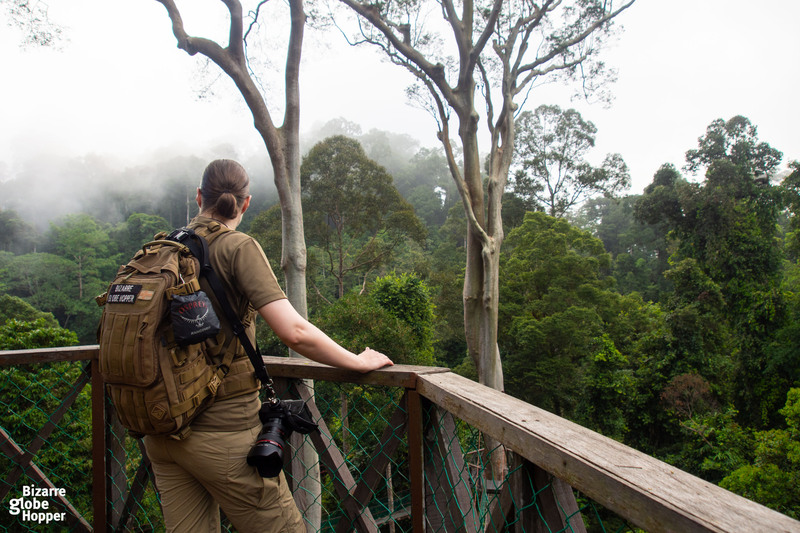 Danum Valley’s world-famous canopy walkway, open exclusively to the guests of Borneo Rainforest Lodge, gives a bird-eye view to the most complex ecosystem in the world. Danum Valley is the Borneo that I had been dreaming about: a misty rainforest canopy stretching out further than eyes can reach, inhabited by shy orangutans and gibbons, elusive pygmy elephants, tarsiers, and even the rarely seen clouded leopards. More than 300 bird species, some of them endemic, make Danum Valley also a birder’s paradise. Whereas over 80% of Borneo’s rainforests are sadly logged, Danum Valley Conservation Area’s 438 square kilometers of lowland tropical rainforest gives Borneo’s wildlife a well-needed shelter. For modern-day Indiana Joneses, it’s the luxurious Borneo Rainforest Lodge, which makes Danum Valley a paradise. You’ll be surrounded by the extraordinary biodiversity, sounds, and smells of rainforest, but living inside a sweet bubble of 5-star luxury: from decadent meals to the lavish comforts of your private villa. Ultimately, the terrace of Borneo Rainforest Lodge is among my favorite places to unwind, with a drink in my hand, staring into the ancient rainforest canopy where no modern man has stepped – the kingdom of wild orangutans.  Talking about exclusiveness: the award-winning Borneo Rainforest Lodge has only 30 luxurious chalets and even more exclusive presidential suites, which have hosted, for example, Prince of Wales and other royalty along with celebrities. Whereas deluxe chalets have privates jacuzzis and views to the Danum River, the standard chalets face the jungle with the best wildlife watching opportunities. And I mean that literally: an orangutan had slept right above our chalet the night before we arrived! Borneo Rainforest Lodge is the only lodge in Borneo, which is located inside the primary forest. 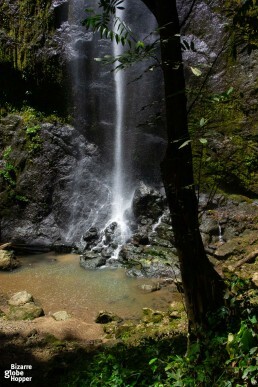 Naturally, it’s the best spot in Borneo to explore the virgin primary forest. After experiencing the different faces of Borneo, it was clear to us that Danum Valley offers the most authentic wildlife watching in Malaysian Borneo. Here, the wildlife sightings are private, whereas in Kinabatangan River you’ll usually share orangutan encounters with other groups. Animals aren’t so used to humans, so they are harder to spot, but that makes the encounters even more magical. To sum up our experience: we saw 6 orangutans and the herd of rare pygmy elephants – twice! In Borneo Rainforest Lodge, you can freely pick your daily activities among morning and evening walks with a naturalist guide, night safaris with a jeep, tubing in Danum River, and canopy trekking. 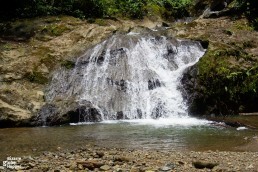 Hiking inside the primary forest is allowed on private trails, which can take you to mesmerizing waterfalls, natural jacuzzi pools, and an ancient burial site. It’s possible to trek for a whole day chasing wildlife in their natural habitat. We loved our early morning walks (up to 4 hours) and were lucky to spot several orangutans. 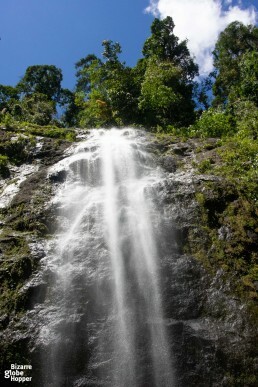 The best part: there are no other tourists at these waterfalls in Danum Valley! Is that tarantula? It's bigger than my fist! Hiking the trails of Danum Valley for hours ripened us for the adventurous yet relaxing tubing experience. Initially, my only fear was the unavoidable encounters with leeches, which are plentiful in the lush rainforest. Before our daily hikes, we used to cover up carefully with insect repellent, long sleeves, and pants, and finished the awesome outfit with special leech socks. 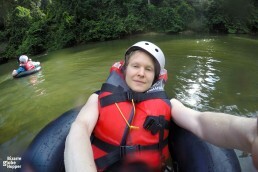 Here’s the trick for overcoming the fear of leeches: for tubing, you have to hike for half an hour through the rainforest, in flip-flops and swimming suit! As intimidating as it felt, we survived – and learned to swipe off the leeches with our fingernails. It became our initiation rite: afterward, we could enter the mighty jungle in t-shirts! The tubing itself was so awesome that we’ll draft a separate article about it. You can take a refreshing dip in Danum River whenever you please: on arrival, your guide shows the best swimming spots nearby the lodge. After the delicious dinner in Borneo Rainforest Lodge (among the best we had in Borneo! 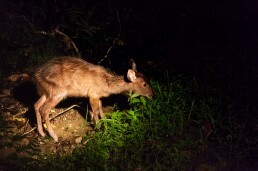 ), you have the luxury to choose between a night walk with a naturalist guide or night drive with a guide and a spotter. 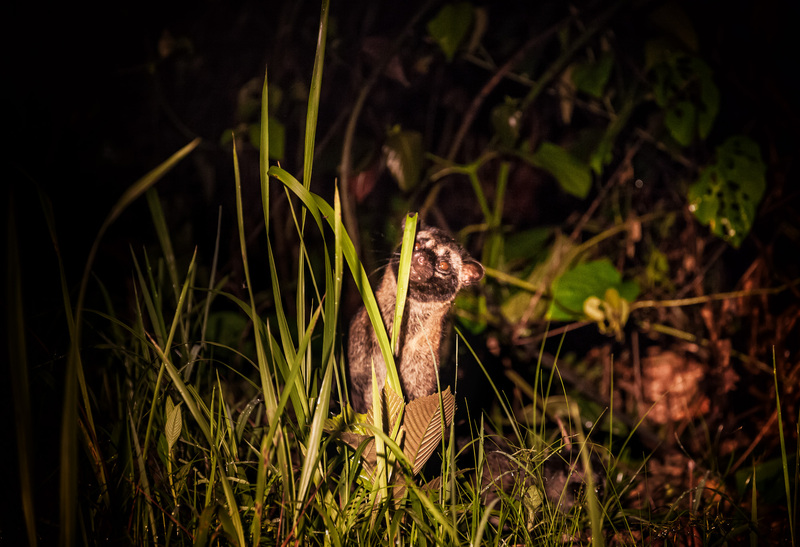 We loved them both but opted to take twice the adventurous drive, which allowed us to tick off some pretty special sightings, such as a civet with babies! Jeep safaris of Borneo Rainforest Lodge reminded us night game drives in Africa. The experience is as polished and adventurous as in the 5-star lodges in Africa’s prime safari destinations. 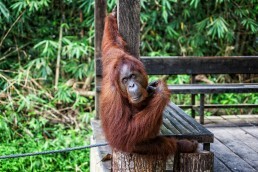 But it shouldn’t be surprising at all, as Borneo Rainforest Lodge is regarded as the best wildlife lodge in Asia. 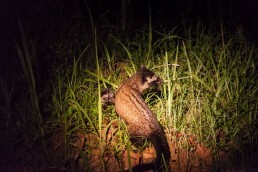 During a night safari in Danum Valley, we met a civet cat with a baby! 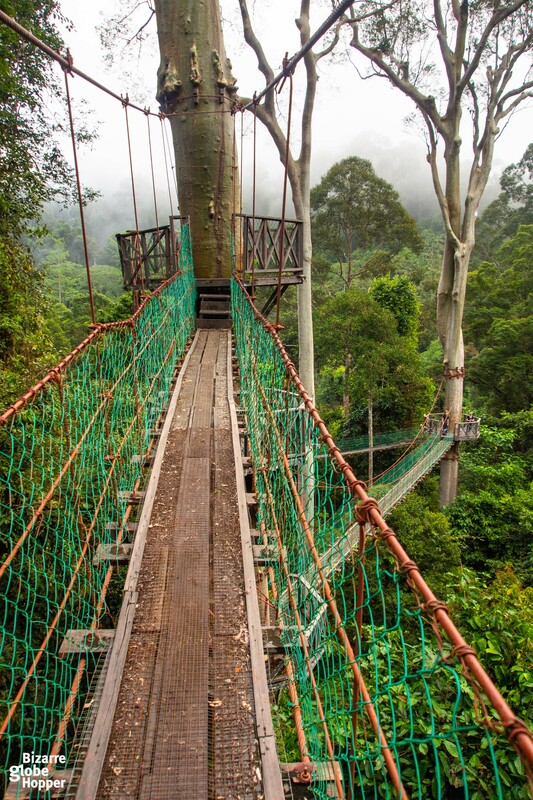 Danum Valley’s gorgeous canopy walkway deserves at least one day hike of its own. Dipterocarp and mengaris trees hold up bridges and viewing platforms, from where you can observe the ancient rainforest canopy in the privacy of your own hiking group. The famous, 300-meter long canopy walkway is exclusively for the guests of Borneo Rainforest Lodge. 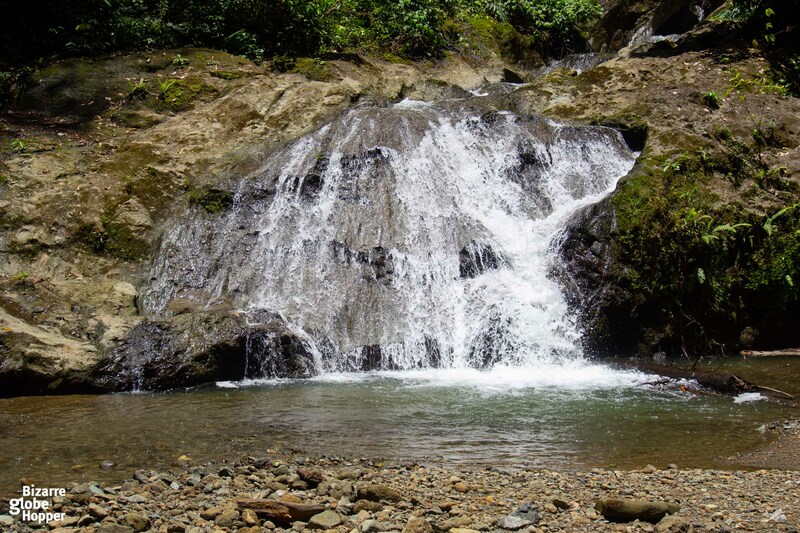 You can also swim in the clear waters of Danum River whenever you’d fancy a plunge: your guide will show you the best swimming spots during the first introduction hike. Planning a Trip to Borneo? Check This First! We make it easier to find the best locations in Borneo: check our ultimate itinerary in Malaysian Borneo for inspiration! Our route covers Danum Valley, Kinabatangan River, Sepilok and Sandakan area, Lankayan Island for the best snorkeling in Borneo, Kuching and Bako National Park, and the capital of Malaysian Borneo, Kota Kinabalu. We squeezed every one of those locations, together with two orangutan sanctuaries and sun bear center, into 2 adventurous weeks. Check the itinerary for further info on transfers and cheap internal flights. It’s a great base for any itinerary between 3 days and one month, as we list further suggestions. Danum Valley is considered as one of the world’s most complex ecosystems. The sheer volume of exotic species leaves you speechless. Still remember those 300 birds? Add also 124 species of mammals and 72 species of reptiles – and 300 species of trees and 200 species of plants per one hectare! 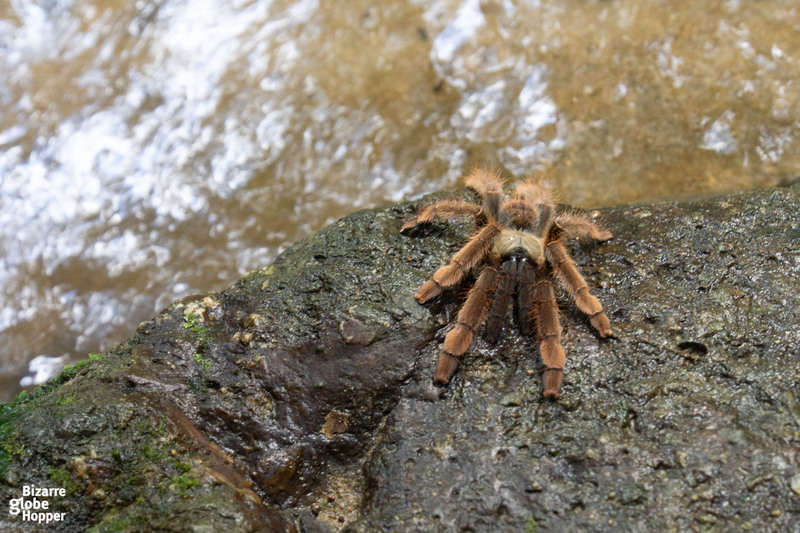 I resist the temptation to list all the weird and awesome fauna and flora here but throw a couple of lines about our wildlife encounters to inspire you to visit Danum Valley someday! 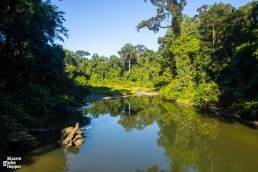 Danum Valley’s ecosystem is so unique that it might get UNESCO World Heritage status (there have been many proposals for the nomination). Our Orangutan Encounters in Danum Valley: Spiced Up With Monkeys! 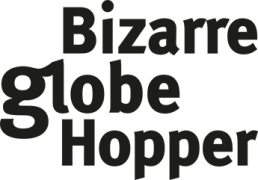 Let’s start with the great apes: while we met around six orangutans, Bornean gibbons hid from our eyes, though we heard their calls echoing through the jungle. Once our guide thought he’d seen one, but it appeared to be a herd of grey leaf monkeys, which are easy to spot, as are their red leaf cousins. One thing is certain with the monkeys: you’ll get annoyed by the opportunistic long tail macaques, in Danum Valley and the rest of Borneo. Check out the complete guide on where to see wild orangutans in Borneo: of course, also Danum Valley is listed! Our wishlist included slow loris and western tarsiers, which we still yearn to spot in the wilderness, along with the rare clouded leopards and leopard cats. In Danum Valley, it’s possible to see leopard cats in the daylight, as they feed on monkeys who are active during the day. 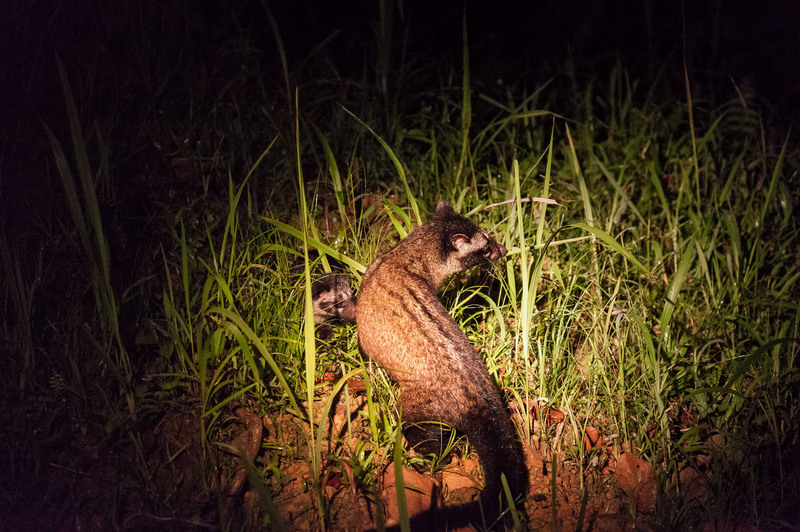 We were extremely fortunate to observe a family of civets during a night safari – even our guide hadn’t seen a civet with babies in ten years! 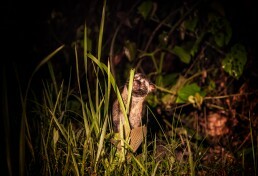 Against common beliefs, civet is not a cat, but a mammal and it feeds on insects and fruits. 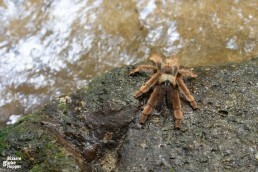 We saw many tarantulas and some snakes. Luckily for me, no king cobras, Sumatran black vipers, or flying snakes, though they are present in Danum Valley. Our guide heard the calls of a couple of endemic birds, including Bornean wrissel head, the number one for avid birders, which we tried to follow the bushes in vain. 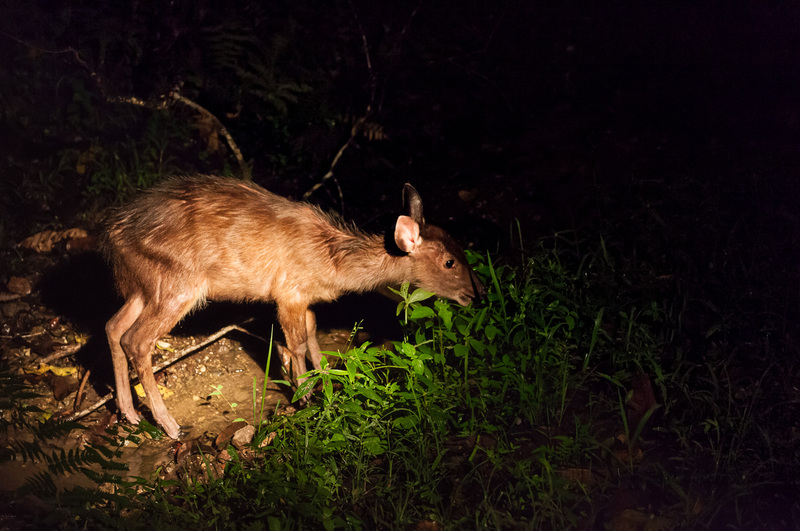 During night walks, fancily colored – and poisonous – frogs were easy to spot, as were the mouse deers. During night drives, we enjoyed several giant flying squirrels, both red and gray, showed off with long flights – or glides would be a more proper term, as technically they just jump and glide. 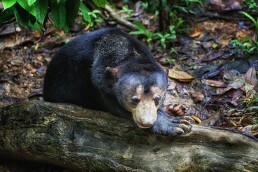 The last stars of the jungle are the rare pygmy elephants and sun bears. The latter are rarely seen in the wild, though our guide had seen many, but usually after dark. 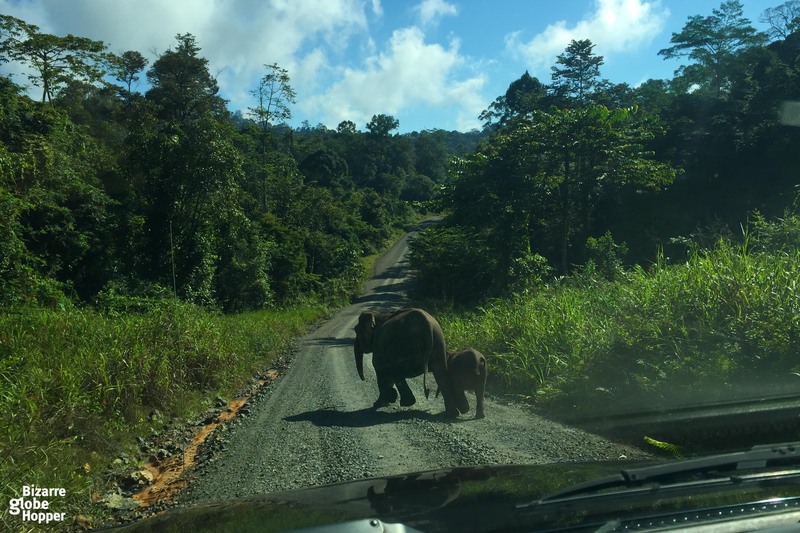 The cute pygmy elephants roam Danum Valley in numbers but tend to live in the secondary forest, just outside the borders of the primary forest. While driving in and out to Borneo Rainforest Lodge, it’s possible to find their droppings by the road. 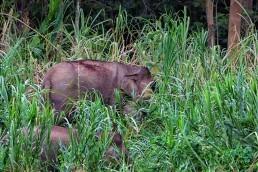 According to WWF Malaysia, there are less 1500 Bornean pygmy elephants left on the island, most of them in Sabah. Both Danum Valley and Kinabatangan River have decent populations. 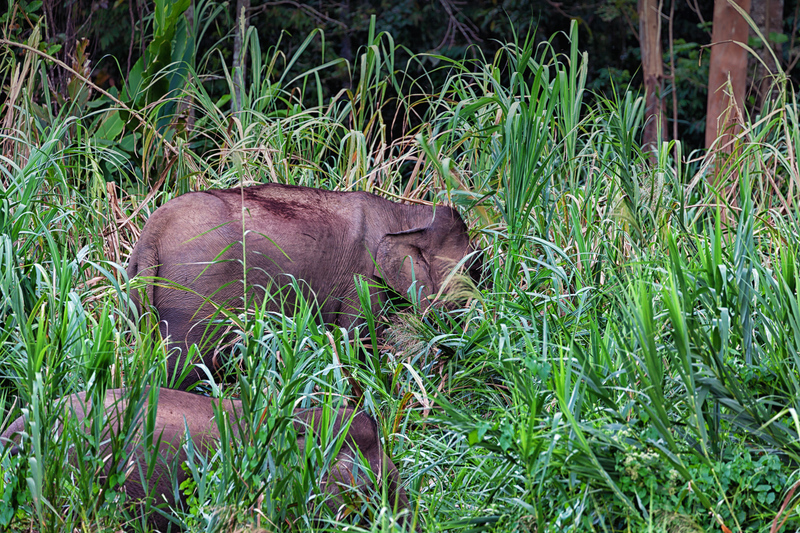 We were extremely lucky to bump into a herd of Bornean pygmy elephants twice during our transfers! As we bumped into the elephants on our transfers, in the middle of the road, we didn’t have our cameras ready and have only mobile photos. Check out our complete article on Kinabatangan River Cruise, where we met a herd of pygmy elephants on the river banks – with better photos! To sum it up: there’s only one hotel inside the enormous Danum Valley conservation area: the luxurious Borneo Rainforest Lodge. I’d highly recommend the splurge, even if you don’t usually stay in 5-star hotels. Borneo Rainforest Lodge gives you a unique access to the last primary rainforest in Borneo, with all the comforts that you could wish for. If you’re not staying in Borneo Rainforest Lodge, you’ll miss the highlights of Danum Valley, such as the night safaris, hikes with your own naturalist guide, tubing, and access to the famous canopy walkway. All activities described above are included in your stay in Borneo Rainforest Lodge. However, if the 5-star prices of Borneo Rainforest Lodge are totally unreachable for your budget, you can try to arrange a stay in Danum Valley Field Center, located just outside the border of Danum Valley Conservation Area. Accommodation is simple with cold showers. Instead of official and trained naturalist guides, the hikes are led by park rangers who just show the trails. 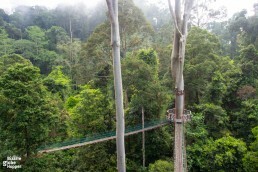 Still, the famous canopy walk remains solely for the guests of Borneo Rainforest Lodge, as well as some of the other activities described here. At the award-winning Borneo Rainforest Lodge, the rainforest experience is as civilized – in the most positive sense – as it can be. Just remember that you’ll still be in the middle of the virgin rainforest – surrounded by the vegetation and all the creatures of the jungle, including bugs and leeches. We utterly adored our time in Danum Valley Borneo Rainforest Lodge – and all the other guests seemingly shared the bliss. The buffet meals were among the best we had in Borneo. All the exciting activities, like tubing and waterfall hikes, were among our favorite things to do in Danum Valley. Still, we probably enjoyed most the serene moments at the terrace, admiring the bewitching views towards the home of truly wild orangutans, while indulging in the sounds and smells of the rainforest. You can book your Danum Valley package directly through Borneo Nature Tours, the tour company running Borneo Rainforest Lodge. 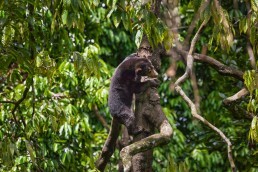 Also, any other Bornean tour operator can add Danum Valley tour to your itinerary. 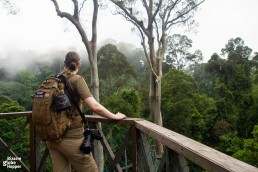 Check out Borneo Rainforest Lodge’s website for current Danum Valley packages and accommodation prices. 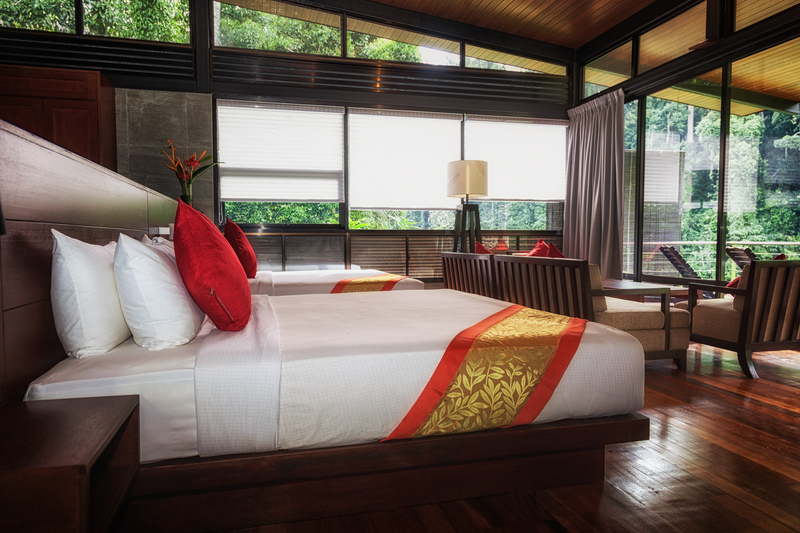 The minimum stay is two nights, but we highly recommend staying at least three nights to experience the spell of Danum Valley – and enjoy the lavish Borneo Rainforest Lodge at the fullest. 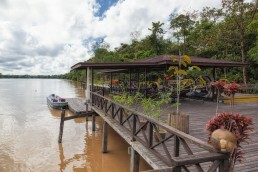 Are you looking for similar lodges in other parts of Borneo? Check our favorite lodges in Borneo! Borneo Rainforest Lodge provides free, private transfers from Lahad Datu in air-con 4×4 jeeps. The Field Center organizes a shared van from and to Lahad Datu three times a week, at a separate charge. Lahad Datu is the nearest town and airport, 82 km away from Borneo Rainforest Lodge. You can either fly or drive there. We took a private road transfer from Kinabatangan River (Borneo Rainforest Lodge or your lodge in Kinabatangan can arrange it), and flight to Kota Kinabalu. Driving from Kinabatangan/Sukau to Lahad Datu takes around 1-1,5 hours. MasWings has daily flights between Lahad Datu and Kota Kinabalu. We flew to Kuching on the same day with an appr. one-hour transfer. Would you love to splurge by staying at the exclusive Borneo Rainforest Lodge, while exploring the virtually untouched rainforest of Danum Valley? 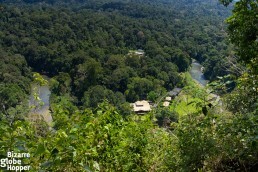 Borneo Rainforest Lodge, the only lodge in Danum Valley, hosted our stay. 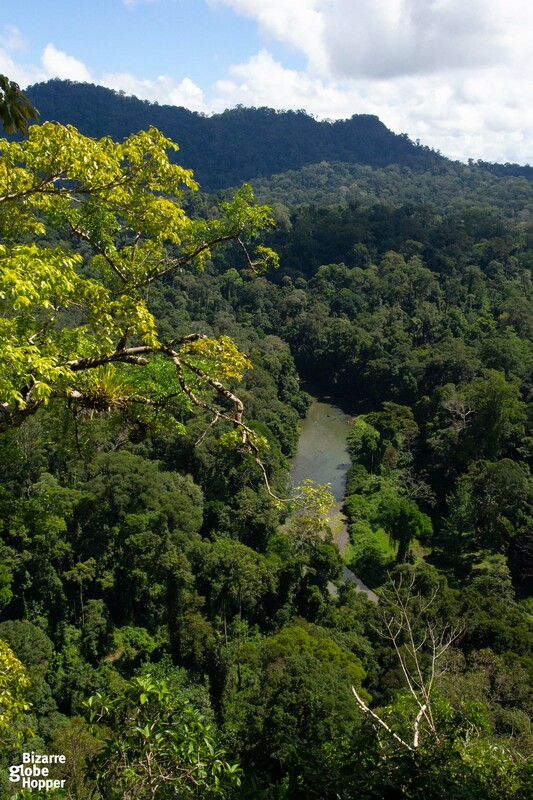 Like always, all opinions remain ours – and we whole-heartedly recommend adding Danum Valley to your route in Borneo. Searching the Best Snorkeling Spot in Borneo? Go to Lankayan Island! The remote Lankayan Island is a paradise island in Malaysian Borneo, with world-class snorkeling. A total seclusion with just one dive resort and blissfully empty stretches of powdery sand. 11 Exciting Things to Do in Sepilok: Perfect Introduction to Borneo! The tiny town of Sepilok offers an exciting prelude to the orangutans, sun bears, and rainforests of Borneo – in just two days. 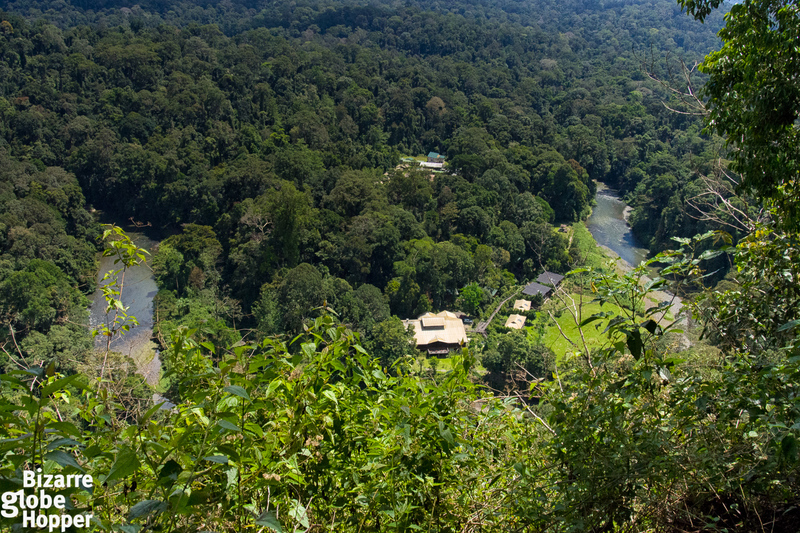 Get inspiration for your Bornean adventures from our favorite things to do in Sepilok! Explore the rainforests of Borneo, swim with turtles on a paradise island, spot orangutans in their natural habitat and stay in luxurious lodges, away from the crowds. Take a boat ride to the Kinabatangan River in Borneo and keep an eye out for the Bornean Pygmy Elephants and Proboscis monkeys. A full two-week adventure itinerary in the Malaysian Borneo. Orangutans, pygmy elephants, proboscis monkeys, primary rainforests and supreme snorkeling on a paradise island. The Bornean Sun Bears are the tiniest bears in the world. Get to know these unique creatures with a pink nose and a huge appetite for honey. 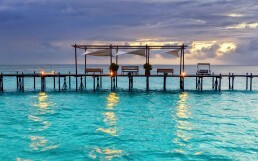 Wow, what a heavenly place.. would love to be there. never heard of it before. Hi Madhu, thanks for stopping by. I know, Danum Valley is my heaven on earth. You should add it to your bucket list! It is quite an amazing adventure. Love the night safari. It is! Danum Valley is hard to beat. Currently, for us, only African safaris can compete with it 😉 I know, the night safari was a real treat! I’m so jelly, it is my big dream! Love your photos and everything about this post! 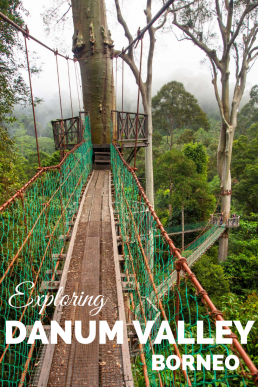 You should definitely add Danum Valley to your list! 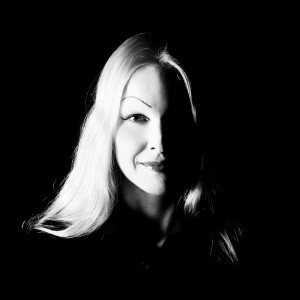 Thanks for your kind words, Marysia, it means a lot, as I love your photos!